Please join Felt Sense Arts Project in collaboration with the Devi Collective for Art Therapy Sunday groups held twice monthly beginning on February 10. 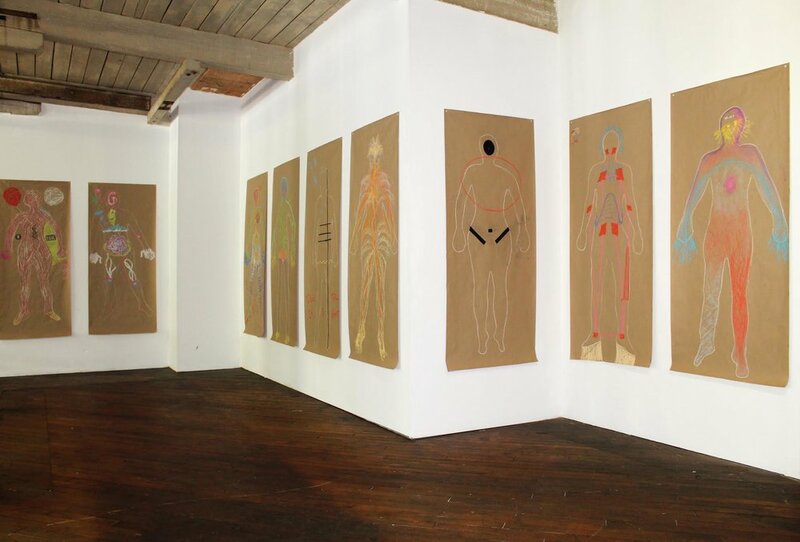 The Felt Sense Arts Project empowers creative expression and self-awareness in a space that’s dedicated to integrative healing through creativity. We use many modalities including, but not limited to, meditation, Reiki, art-making to free the creative. Robyn Olds and Alice Shockey will be holding art therapy groups for anyone wishing to get more in touch with their creative process. There is no previous art experience necessary, only a curiosity to explore and an openness to one’s inner-experience. We are here to offer a meditative experience combined with intuitive art-making that frees the creative impulse and encourages flow and deep healing. We will begin each group with a check-in and guided meditation to help you feel more in touch with the present and your felt sense of self. With a variety of healing tools including meditation, Reiki, art-making and visualization we will hold space for an exchange of insight and ideas. There will be plenty of time for art-making and individual exploration within the group. We hope you will leave feeling more in touch with your inner truth and empowered to create change. (cross-street Humboldt St, close to McGolrick Park Park). 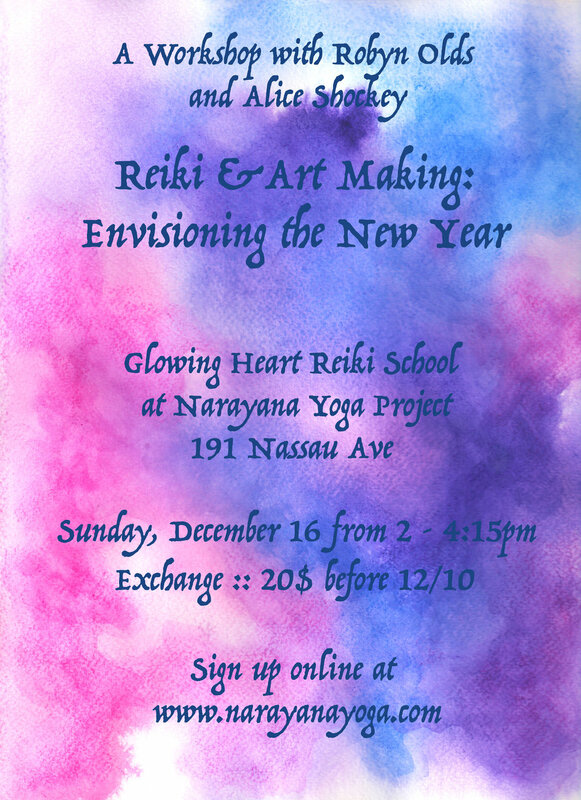 Please join Visual Artist Alice Shockey and Art Therapist Robyn Olds for an afternoon of meditation, art making, and Reiki in collaboration with Glowing Heart Reiki School. Exchange // $25 ($20 before 12/10) mixed-media art supplies and paper provided. This workshop is open to all who are looking to develop an integration of visual art into their Spiritual practice, and in connecting with an internal experience of imagery and sensation as we envision ourselves in the new year. We will be leading you through a clairvoyant body-scan meditation that will help you to visually map your internal experience and to explore what imagery and sensations arise in the body. Throughout this process of meditation and art-making we can notice how our internal experience wants to shift and expand as we create a version of ourselves that we envision in 2019. We'll be exchanging Reiki and offering these internal shifts impetus as we come into ourselves and begin to call in a new year. 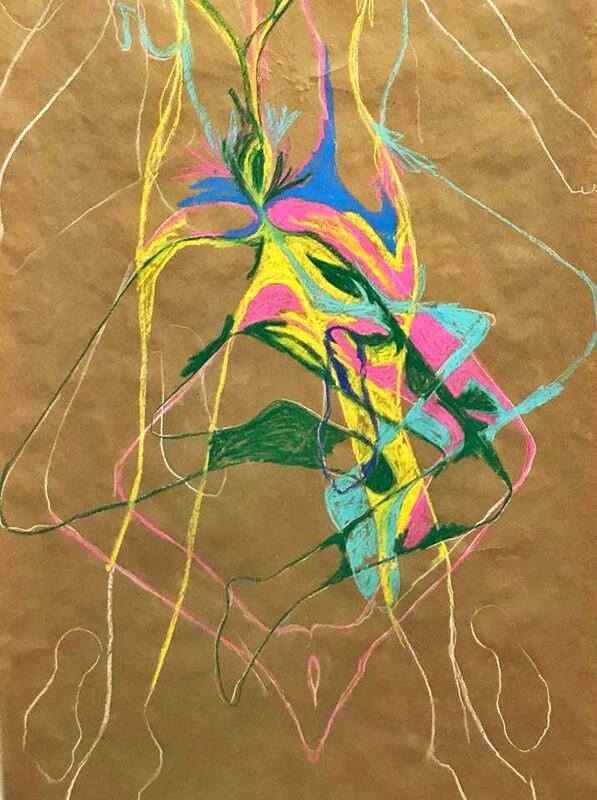 Please join Visual Artist Alice Shockey and Art Therapist Robyn Olds for an afternoon of guided meditation and art making in collaboration with Daya Yoga Studio. We invite you to develop your creative process as we lead you through a body tracing exercise that will help you to visually map your meditative experience. This map can be used as a play space to explore what colors, images, and sensations arise in the energetic and physical body as we fluctuate between a guided body scan and clairvoyant grounding meditation, and creative art-making. We hope that you’ll be able to walk away with a new understanding of how embodied meditation and visual art can be integrated into your daily lives. We are pleased to invite you to join Art Therapist Robyn Olds and Visual Artist in Resident Alice Shockey for an afternoon of meditation and art making at Arts Letters & Numbers on Saturday, September 1st from 4 – 6pm. We invite you to develop your creative process as we lead you through a body tracing exercise that will help you to visually map your meditative experience. This map can be used as a play space to explore what colors, images, and sensations arise in the energetic and physical body as we fluctuate between a body scan and clairvoyant grounding meditation and creative art making. We hope that you’ll be able to walk away with a new understanding of how embodied meditation and visual art can be integrated into your daily lives. We will be providing paper and drawing supplies, however we recommend that you come with your own blanket and pillow to use during the meditation. This workshop is open to the public, but we welcome any contributions. We’re looking forward to spending this time together in such a creative space at Arts Letters & Numbers and hope to see you all there. Come join Visual Artist Alice Shockey and Art Therapist Robyn Olds for an afternoon of meditation, art making, and Reiki in the newly renovated Art Studio at 274 St Marks Avenue in August 11 from 3 —6pm. We invite you to further develop your Reiki and creative process as we lead you through a body tracing exercise that will help you to visually map your Reiki experience. This map can be used as a play space to explore what colors, images, and sensations arise in the energetic and physical body as we fluctuate between a body scan and clairvoyant grounding meditation, creative art making and Reiki exchange. We hope that you’ll be able to walk away with a new understanding of how Reiki and art can be combined in your own practice as Reiki practitioners and integrated into your daily lives. We will be providing paper, drawing supplies, and mats, however we recommend that you come with your own blanket and pillow to use during the Reiki share. This workshop is open to all creative people who are looking to develop an integration of visual art into their Reiki practice. We’re looking forward to spending this time together in such a creative and compelling space and hope to see you there.